The vertical line shows where the population of Americans 65 years or older stands today, about 49 million. 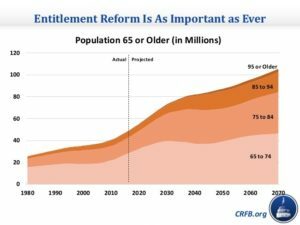 Within ten years, it will rise to some 68 million, adding 19 million to the Social Security, Medicare and Medicaid roles, the most-costly entitlement programs. Coupled with all the other spending programs, $20 trillion will be added to the public debt over the next ten years, pushing the nation’s debt to 150% of Gross Domestic Product. And, all this assumes no recession over the next decade, which would reduce government revenues and increase welfare spending, further increasing the government’s debt beyond $40 trillion in ten years. To alleviate the entitlement strain, two things should be done. Not one thing but two. First, a reduction in benefits; second, an increase in taxes. Neither would be acceptable to Americans over the age of 65, the most prolific voting-block in the country. So, what’s to happen? Inflation. Yes, inflation, the creation of still more dollars, a process that has — since the introduction of the Federal Reserve System in 1913 — cut the purchasing power of the dollar to 4% of what it was 105 years ago. As the Fed cranks out dollars to finance the exploding debt, prices will rise much faster than the COLAs (Cost of Living Adjustments) that are attached to Social Security and supplemental security income. COLAs are based on the consumer price index for urban wage earners while senior citizens receiving these entitlement funds spend mostly on health care, which is one of the most-costly sectors in our economy. Interestingly, Alan Greenspan recently said that gold is superior to all fiat monies and that countries that don’t have gold face dangers during times of currency difficulties. He says the reason the entire world keeps gold in reserve is the fact that gold is money. Inflation and too much debt are the primary causes of currency difficulties — the problems that the US is facing. 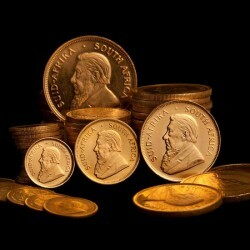 Click here for a five-minute interview about gold with Alan Greenspan.